Politicians at all levels of government had something to say last week on the I77 HOT lanes. Here are a few of the gems collected from cyberspace before and after the project’s financial close amid swelling opposition. In an email to one area residents posted to the Exit 28 Ridiculousness Facebook page, US Senator and former Speaker of the NC House, Thom Tillis had this to say regarding the project. It takes an impressive amount of chutzpah to send that to a constituent when you yourself had been the state Representative just a short time ago who had the most influence to actually stop the project. One of my early blog posts on the HOT lanes project from way back in March 2013 was titled “HOT Lanes: The Empire Strikes Back”. It recounts WidenI77.org activists trekking to Raleigh to do exactly what Senator Thom Tillis suggests in this email. They went to meet their then-Representative, Thom Tillis, to discuss their concerns. Instead of a meeting with their Representative, they were met by a room full of people including, NCDOT staff, consultants, and even media listening on the phone. As you can imagine that meeting didn't go well. Also last Tuesday, former Cornelius Mayor Lynette Rinker posted the below to County Commissioner Matthew Ridenhour’s Facebook page. The post came as the County Commission prepared to vote unanimously asking for a delay in the project. As Mayor, Rinker cast the tie breaker in favor of tolls when it came before the Cornelius Board in a surprise vote in May of 2013. She knows a little about “winning for the sake of winning”. Ms Rinker now serves as the MeckGOP Vice Chair where that skill-set will likely come in handy. The next day, the below appeared on Governor McCrory’s Facebook page after a speech to the Republican Governors Association. It came just hours after the deal with Cintra was inked. It is telling that the Governor specifically mentions the Connect NC Bonds while keeping mum on the HOT lanes. If he was proud of what his NCDOT had done earlier that very day by signing a 50 year contract with Cintra, don't you think he would have mentioned it? Finally, there’s this from District 1 County Commissioner, Jim Puckett. His comments are a breath of fresh air in their directness after so much political double-talk. In an email from Puckett posted on Facebook by former Cornelius Commissioner William Rakatansky, Puckett unloads and says what many in this area are thinking. Davidson has a well earned reputation for being a well planned town. The town regularly receives awards and recognition for its efforts in promoting walkability, the protecting open space, and preserving its Main Street area. However, there is a flip side to this approach that can turn into something that often looks less than welcoming. There is an undercurrent through many town decisions on planning and development that often looks like infringement of property rights. Take for example the onerous deed restrictions currently required by the town’s affordable housing ordinance. Currently, the town requires buyers in the program to agree to 99 year deed restrictions that limit the price they can sell a home – regardless of what the market can bare. That may seem reasonable to some because it's a restriction agreed to upon purchase. Another example where the town seems to fear the free execution of property rights comes in its recurring opposition to bills in the General Assembly that impact planning in any way. Over the years the town has fought efforts in Raleigh to pass legislation that limits what design restrictions a town can place on homes. The current incarnation of this bill working its way through the Legislature is actually sponsored by our very own Senator Jeff Tarte. According to current and former sponsors of these bills – bills that have received strong bi-partisan support it is clear that they would have minimal impact to Davidson. But, if you listen to the rhetoric coming out of Davidson Town Hall, you would think they gut planning ordinances across the state. These first two examples deal with development and limits on property rights where development actually is approved, but the most obvious infringement on property rights occurs when the town attempts to prevent development altogether. The ongoing brouhaha over the proposed Narrow Passage neighborhood off of Rocky River Rd provides a perfect example of that scenario. The local Mayes family has owned the land for over 100 years and working with local builder, Karl Plattner, has proposed building 47 houses on roughly 59 acres at the corner of Rocky River and Shearer roads. The proposed development will have large amounts of open space. It fits with the other surrounding development – including River Run which is right across the road. It will add a nice bump to the town’s tax base. The idea that those involved are somehow intentionally proposing something that would harm Davidson is laughable. The proposed development goes against a belief among some that Davidson should not allow development – any meaningful development - along Shearers Rd. To listen to some opponents of this proposal you would think they are the ones that own the land – talking about how important it is to them, talking about what it means to them. Unfortunately for them, they don't actually own it. The town has used its ordinances and process to throw up barrier after barrier in attempts to delay or outright prevent this development from going forward. While not exactly the same situation, it evokes similarities to a case recently lost by NCDOT in the NC Court of Appeals. In this case, NCDOT used something in its planning efforts called the Map Act to prevent landowners from developing their land – sometimes for decades – without compensation. The appeals court recently said in a unanimous decision that the NCDOTs actions resulted in a legal “taking” of the property and the landowners needed to be compensated at the time NCDOT placed its development restrictions on the land. Davidson’s zeal in opposing development in certain areas at times approaches that same threshold. Infringing on personal property rights is something government should do with extreme caution. In Davidson, it seems to be a standard approach to doing business. With Mecklenburg County now on-board with postponing the HOT lanes project on I77 until thhe contract is audited for more irregularities, our state Rep John Bradford has stepped into the fray. After Tuesday's vote he posted the below on the LKN Election Connection Facebook page. "I am respectfully encouraging all CRTPO members to work to amend their agenda tomorrow night and formally consider asking the NCDOT for a delay in the financial close of the I-77 project. The ground rules of this project have changed with the introduction of a possible new funding option (i.e. bonds) since MUMPO (now called CRTPO) decided back in 2007 to sanction a Fast Lanes study that would ultimately recommend express managed lanes. I do not think this group of elected officials would have made the same decision if they knew that a possible third funding option (i.e. bonds) was a possibility. It seems to me that a request for a delay in the project's closing is very reasonable and it would send a clear message to NCDOT that the decision over 7 years ago to support managed lanes was made under a very different set of funding possibilities." Of course, after revealing Tuesday night that he cannot vote on the project, Mecklenburg County's, Dumont Clarke should not vote not be the project as the county's CRTPO member. At the Tuesday MeckBOCC meeting Clarke had to admit publicly that he has a conflict of interest on the toll road project via his firm's involvement with a client. Clarke recused himself from voting on the MeckBOCC amendment. Clarke works for high powered law firm Moore and Van Allen. If you are interested in supporting Rep Bradford in his request CRTPO change course, email members at the below addresses asking them to include a vote on a HOT lanes resolution in tonight's agenda. Huntersville Commissioner Sarah McAulay chairs the body. She can put this on the agenda if she wants to do so. Hers is the first address. “Reasonable” is relative to one’s ability to pay, but that works out to $3.84 up to $10.40 one way for a full-length 26-mile ride - numbers surprisingly close to those presented by NCDOT consultant, Stantec. When those numbers were made public last year, local officials did backflips trying to debunk and minimize them. Based on the credit agency reports, somebody definitely knew. They just didn't want that somebody to be you. Facing a rapidly changing competitive environment, Mi-Connection received some good news on the financing front this week when on Tuesday the Local Government Commission in the NC Department of the Treasurer approved refunding of the system’s originally issued debt. In recent years the cable system owned by Mooresville and Davidson has made several operational improvements to reduce expenses. However, since it's inception the large debt used to purchase the system has been the major driving factor contributing to the company’s ongoing losses. Restructuring the company’s debt will be another step in the right direction on the long road to break even financially. New debt will be issued at more favorable terms – reducing interest payments and potentially reducing subsidies from the towns of Mooresville and Davidson. The exact amount of those savings will not be known until the final transaction closes – an event scheduled to occur before the end of June. The annual savings could be substantial though. At the recent Davidson Board work session, Commissioners and Staff were using $500,000 as a working number for the saving when discussing Davidson’s next budget. Based on the ownership agreement between the two towns, that would reduce the subsidy from the towns by $150,000 for Davidson and $350,000 for Mooresville in FY2016 which starts July-1. This is on top of about $300,000 in savings this coming fiscal year from refinancing another piece of the company’s debt. Exactly how the towns could or should spend these savings is a topic for another day. The good news is that Commissioners will at least be able to have that discussion while putting together the next budgets. The potentially bad news is that all of this is occurring in a rapidly changing business and technological environment which could eat up those savings as Mi-Connection is forced to keep up with its competitors. At the system’s quarterly board meeting last week, Mi-Connection announced the region’s first gigabit data service available to its commercial customers. This is certainly good news, but it does nothing to help residential users who have been paying the subsidies to the company over the last several years. It is in this area that Mi-Connection may soon be playing catch-up. In early April, Time Warner Cable announced the rollout of its TWC Maxx service in the Charlotte region beginning this summer. This will include Huntersville and Mooresville, and other areas right on the doorstep of Mi-Connection’s current footprint. When this conversion to an all digital network is complete, TWC will be able to offer customers much faster data service at the same cost. The top announced speed will be 300mb download. That’s 5 times faster than Mi-Connection’s current top residential offering. In response, Mi-Connection is currently “testing” their ability to match these 300mb download speeds. This test is occurring in Mooresville’s Oaks on Main neighborhood. Per an email from Mi-Connection CEO, David Auger, it could be expanded to include other areas as well. One of the purposes of the test is to determine the capital costs (if any) necessary to roll the service out to the entire Mi-Connection footprint. Depending on the results of these tests, those capital costs could eat into some of the operational and financing savings the company has recently achieved. That would also mean more subsidies. And in that situation, there lies an unfortunate irony. Readers may remember, that one of the justifications used by Mooresville and Davidson officials in buying the remnants of the old Adelphia cable system and creating Mi-Connection was that Time Warner, who was managing the operation in receivership at the time, was unlikely to upgrade the system. If the towns had not taken control to offer better service, then nobody would have is how the story goes. In fact, during a discussion in recent weeks on Mi-Connection both Davidson Mayor John Woods and Town Manager Leamon Brice referenced this idea as if it still had merit. That Mi-Connection is having to conduct tests and potentially spend more subsidized money in an effort to keep up with announced improvements from Time Warner belies that original justification. To put it another way, if Time Warner had been allowed to buy the system back in 2007, the average citizens of Mooresville and Davidson would be about to get for free the same service they might be able to get from Mi-Connection in the future. Along the way, they could have also avoided the tens of millions in subsidies. Since starting this column,, a concerted effort has been made to not write about the same topic two weeks in a row. But for every rule, there is an exception. This week is one of those exceptions. The last column told you about a long-shot opportunity to stop the tolling of I77 with HOT lanes through a bill submitted at the General Assembly by local Senator Jeff Tarte. Well, since writing that piece the project to build toll lanes has gained some momentum in its trek towards financial close of the deal between I77 Mobility Partners – the local offshoot of Spanish contractor, Cintra – and the NCDOT. The first big piece of the financing puzzle that appears to have fallen in place is the apparent approval of $189 million in Federal loans to I77 Mobility Partners from the TIFIA Credit Council within the US Department of Transportation. WidenI77.org – the group that has been fighting the toll project - actually broke the story on their website on Friday, April 17th. Members were holding out some hope that their source had “jumped the gun” in providing that information, but it now appears that is only thing left to do is get the signature of the Secretary of Transportation. That just happens to also be from former Charlotte Mayor, Anthony Foxx. A second major financing event also occurring over the past two weeks. This time the action took place at the state level in the office of the Local Government Commission which is part of the NC Department of State Treasurer. After two “special meetings” called on the subject of I77 financing, this Tuesday the LGC approved an additional $105 million in bonds to be sponsored by the NCDOT on behalf of I77 Mobility Partners. So, after multiple delays, special meetings, excused penalties, and more state money being thrown at the project it does now look like the toll road contractor is limping towards financial close on May 17th. With all of that as backdrop, a few other events occurred over the past two weeks – both locally and nationally - which serve to rub salt in the wound for toll road opponents. They provide a glimpse of the possible future as well as insight in how we got here in the first place. The first event occurred in Atlanta on the I85 HOT lanes. On a Monday, 4/21, the road hit a new record high for tolls – $10.50 for a one way trip on the 16 mile stretch of road. That record lasted a single day. On Tuesday the toll hit $11. Readers may remember when WidenI77.org helped break the news that NCDOT’s own consultants predicted $11 tolls for the I77 project. They helped pry that information from the state with repeated public records requests. Project supporters and some local media decried publicizing those numbers as nothing short of scare tactics. In one email between local mayors, Mayor Swain of Huntersville called the consultants’ report “old news”. Tolls that high certainly aren't “old news” for those in Atlanta. They are a current and very real hit to the pocketbook. The second event that could foreshadow the local experience with HOT lanes took place in the Washington, DC area. There, local HOT lanes users are suing toll rode operator, Transurban, for illegally gouging users. In some cases, missed tolls of a few dollars have turned into fines of several thousand dollars once penalties are applied. Are these events that occurred elsewhere in the country, the kinds of things I77 HOT lanes users can expect over the next 50 years if this project goes forward? Maybe. The final event getting attention over the past two weeks occurred locally and seems likely to generate more activity. Last Wednesday, Rep John Bradford of Cornelius announced via his Facebook page that Mayor Chuck Travis of Cornelius had been appointed to the board of the North Carolina Turnpike Authority – the body responsible for rolling out toll roads across the state. Cornelius has been a hotbed of opposition to the HOT lanes. The irony of the town’s mayor being placed on a board to promote toll roads was not lost on members of another Facebook page – the 2400 member and aptly named “Exit 28 Ridiculousness” page which sees frequent posts about local roads. 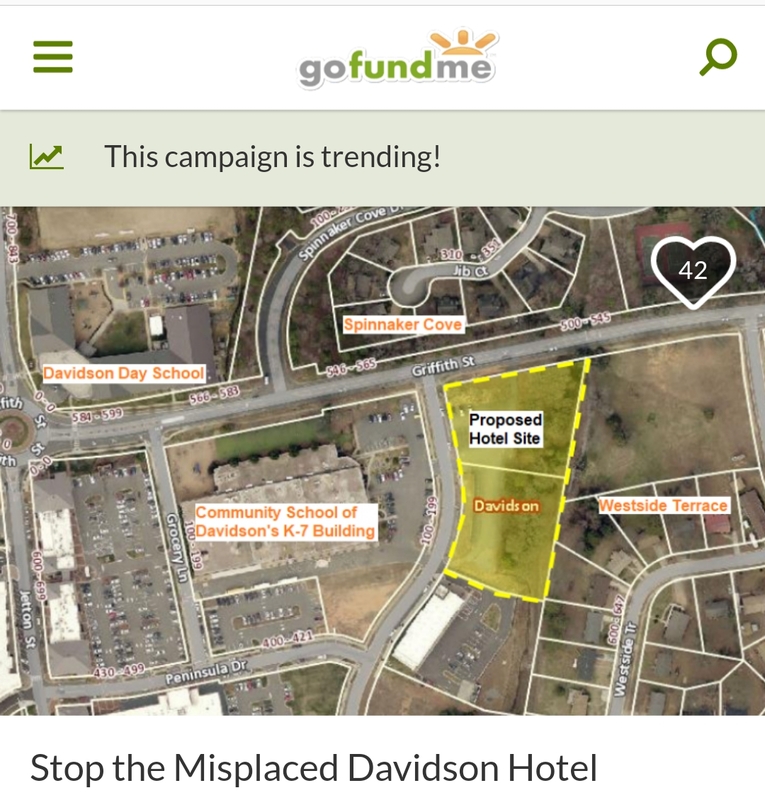 The appointment seems to have spawned a renewed outpouring of opposition to the project among the “Exit 28 Ridiculousness” community and some WidenI77.org activists. This Friday, 5/1, they are organizing a protest from 430pm – 630pm at Exit 28 itself. A version of this post first appeared in this weeks's Herald Weekly.